Is the shoe made of leather? It sounds obvious but there are synthetic ones. Is the stitching good or loose? Does the seller offer a guarantee? Are they knowledgeable about shoes or are they just a reseller? Does the shoe feel like it flexes as you walk? If the sole doesn’t flex the upper will stretch and you will get a loose shoe and blisters. 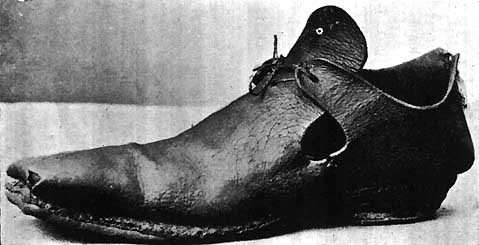 This is a picture of an actual 17th century open sided shoe from a book called The Romance of the Shoe as far as I can work out and is ideally what you should be looking for. Although this is not a cheap option, a well made pair of latchets should last you a long time if they’re looked after. 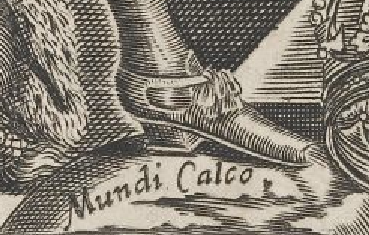 The square toe isn’t necessary, in fact most shoes of the period had round toes and the theory is that they were more sturdy and harder wearing than square toed examples. 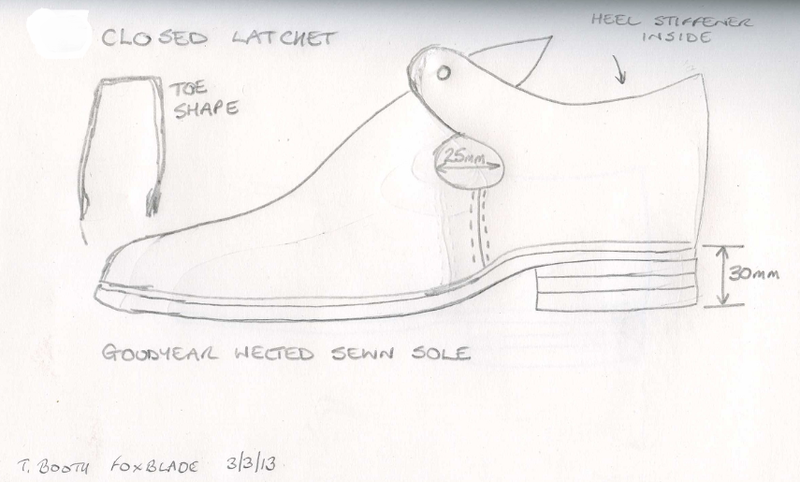 The side seam is level with the fastening and also notice the shaping around the heel. Here are two more repro shoes, both by Chris Thomas. 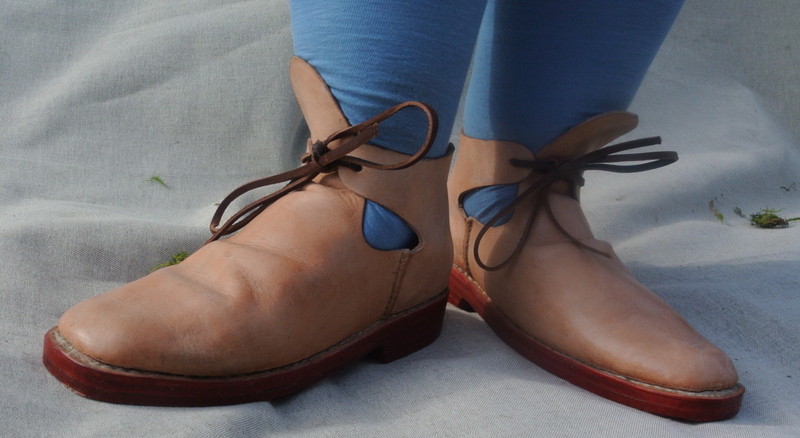 On the left a pair made for a lady, though note there’s no real difference to the men’s shoes above and on the right a more practical close sided shoe that may be more suited for a labourer. 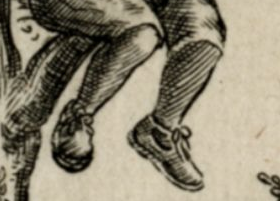 As we have discussed, the more open sided shoe was probably more likely to have been army issue as it has a certain amount of size adjustment built in, but this style would be more weather-proof. Notice still that the side seam is more or less in line with the front of the heel. 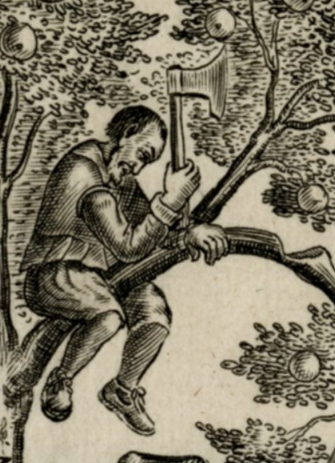 This guy is a detail from the Shepeard’s Oracles by Francis Quarles, published in 1645. He’s wearing low heeled shoes with large side openings. 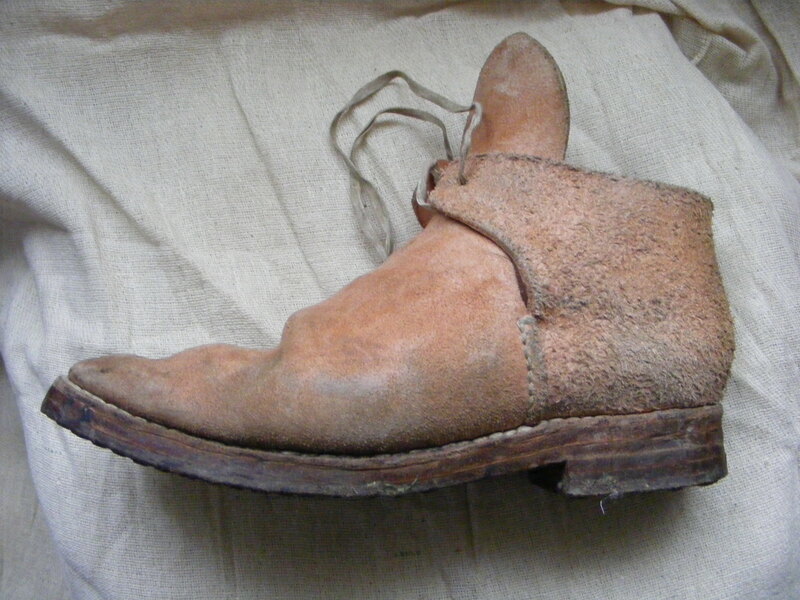 Follow this link to a variety of images that show shoes being worn from the period. And two pictures that show either end of the shoe spectrum. 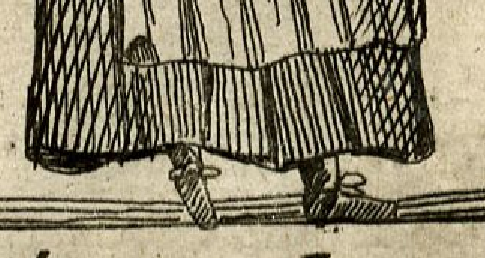 A pair of flat shoes worn by a melon seller from Cries of London 1654 and the King’s heeled shoe from the fronticepiece of Eikon Basilike. oh, I’m quite capable of making the clothes myself – in fact I think my mother still wears the c17th outfit I made for her when I was 17 – it’s just the time. I’ve been itching to make something c17th again since jenni’s book came out a few years ago, but I have so many other projects begging for my time, and to be honest after work in the evenings I’m not really capable of garments, embroidery is about all i can do in the evenings cos its a bit more brainless.